After posting about my recent window decorating efforts using hot glue, I felt a bit guilty. Suddenly I had a strong urge to come clean, in a sense (certainly not literally), about another area of our home. See, once I get inspired to do something creative and I can gather my supplies, I'll usually get to work quickly. Creative is fun, it's pretty and you use cool stuff. Cleaning and organizing? Not so much. At least for me. 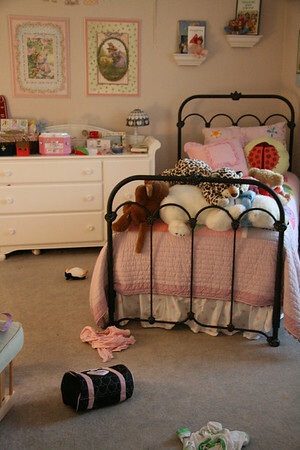 Let me show you what I am talking about as we take a peek upstairs in Annelise's room. A little over a year ago I got all Organizationally Inspired and tried to tame her toys in containers and bins. I was so proud of myself because things had a place and her room looked tidy. Then I kinda forgot about it and moved on to other things. Maintain the system? Nah. 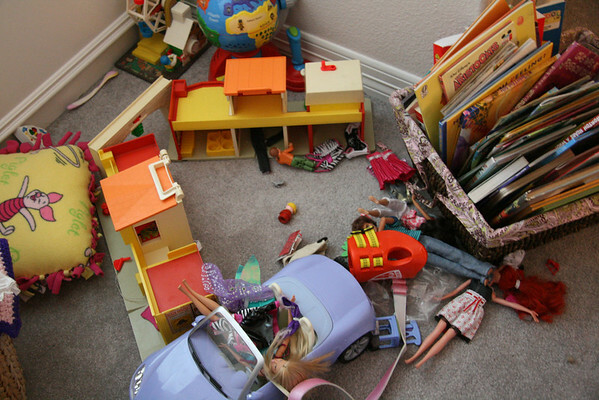 Routinely purge old toys and junk? Nope. Things went downhill rather quickly, especially because A. is a packer. She is constantly packing for her imaginary trips and excursions in various purses, bags, boxes and backpacks. This drives me bug-eyed crazy because she never unpacks. She might occasionally dump, but not really put things back in their proper home. As we enter her room, be careful to step over her discarded dance bag, stripped off leotard from dance that afternoon and her PJs from that morning. She did make her bed though. Love that. Beside her bed we find Barbies playing with some Little People and other dolls. 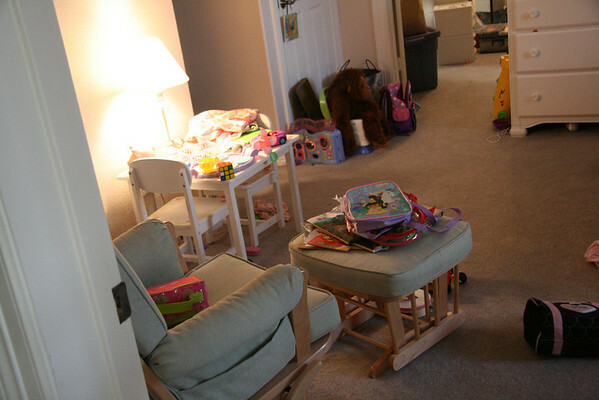 Her table and chair are piled with miscellaneous packed bags, books, crayons, papers and toys. In front of the closet is a gorilla in an old booster seat (What, you don't have one too?) another packed backpack and a shopping bag of hand-me-down shoes that I need to go through. Then there is her closet. See, there is a figment of an organization system, but it is sadly neglected. 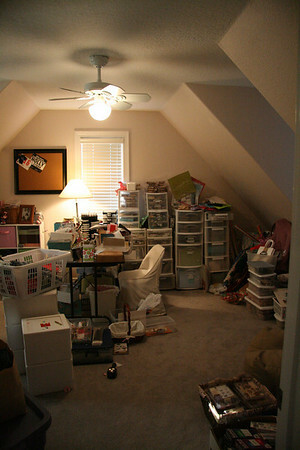 Once you have safely made your way through her room, you enter my craft room. Also affectionately known as the room that gets everything else that doesn't have a proper home. See? I have no words. My head is hung in shame. I cleared off the dining table from my little stamp thing a couple of weeks ago and it all got piled on top of my work table. Work? Craft? Create? I can't do anything until I tackle that despicable mess. 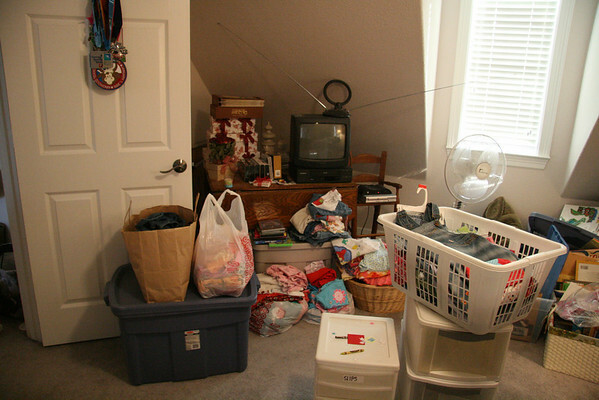 Over in the other corner you see tubs and piles of clothes for A. that need to be sorted, rotated, passed along, etc. We are so fortunate to receive hand me downs from two well dressed girls that are older than A., but I don't have a decent system/plan to store everything. It quickly becomes overwhelming and I ignore it. I've obviously got the whole ostrich thing down. Even though I know the de-cluttering and organizing will be satisfying and rewarding, I can't seem to start because the enormity of the mess paralyzes me. See, it's MUCH easier to ignore it and decorate my family room windows. Are we still friends? How do you tackle jobs that seem paralyzing to you? Are you an ostrich too about some things? I will say, I am not so brave to post photos....I feel like that hoarding woman on Dr. Phil! We are still friends, I think I even saw a Rubix Cube in one pic! When my kids make beds they stuff pj's, toys, books, and all other kinds of junk up under the sheets! I think we all do this, so it's very comforting to see how it looks in someone else's world. 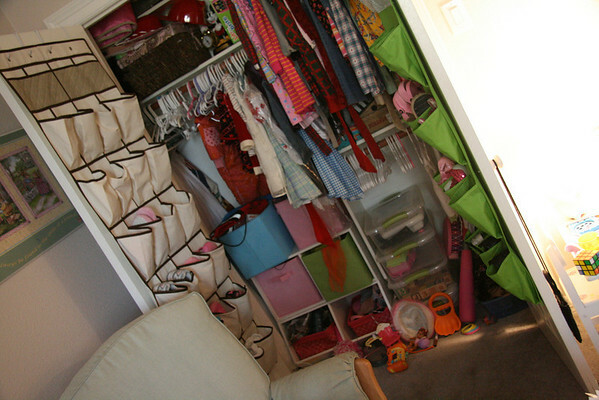 I go in organizing spurts but usually only end up with a few days of glorious clean before things get trashed again, especially in the kids' room and with the closets and garage. Our house is small so those places take up a lot of our room. Ahhh. 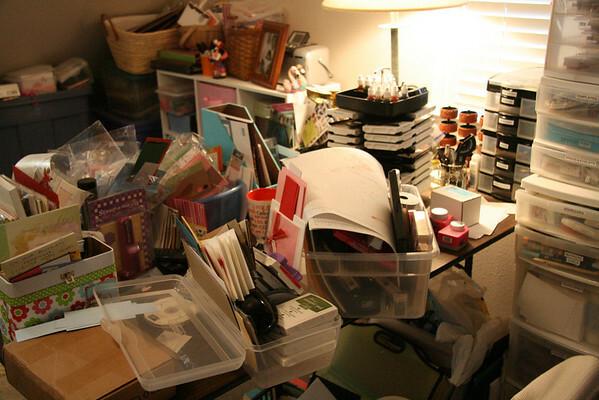 At least I'm generally okay with the mess in my craft room because it's out of sight and is all stuff I love. It probably helps that it's all my stuff and not anyone else's. I've pretty much been an ostrich this past year too but times are a changin' around here. We cleaned stuff out of the garage and bedrooms yesterday and brought PILES to the Goodwill. I then tackled my college daughter's room. Washed walls, baseboards, bookshelves and got it all sparkly. I can't bring myself to take her furniture out but I'm going to transform it somehow into my own space. Things are lookin' up! I am too chicken to even take the pictures! Thank you for your honesty...it is very reassuring! oh good golly...i won't lie that is making my head spin. when i have to sort, i set aside an entire day (so have the hubby take the kids out) and turn on some music and just get down to it! Sorry...I know it's quite scary, which is part of my paralysis. I'm out there Jerry, and I'm lovin' every minute of it! Chin up. You're not saying anything any of us don't do. A's room looks clean to ME, actually. You should see my kids' rooms. Shudder.